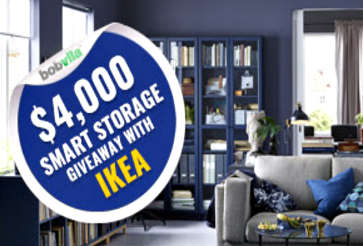 Bob Vila’s $4,000 Smart Storage Giveaway with IKEA Sweepstakes – Win a $1,000 IKEA gift card! Win a $1,000 IKEA gift card (4 winners)! ENTER SWEEPSTAKES HERE – Bob Vila Sweepstakes page. ENTRY LIMIT – Limit one entry per household per day. ELIGIBILITY – Open only to permanent legal U.S. residents of the 48 contiguous states and the District of Columbia who are age 18 or older. SWEEPSTAKES ENTRY PERIOD – The Sweepstakes and entry period begins at 12:00 p.m. EST on December 31, 2017, and runs through January 31, 2018. PRIZES – Four (4) winners will receive a $1,000 gift card.